I'm way behind in posting about the MATS B course I took last month, but better late then never! Each week of this amazing five week course was devoted to a different commercial art market. Week 1 was Paper, and our assignment was to design a winter holiday greeting card. I actually had studied a lot about toy trains when i illustrated Good Night Engines by Denise Dowling-Mortensen many years ago! 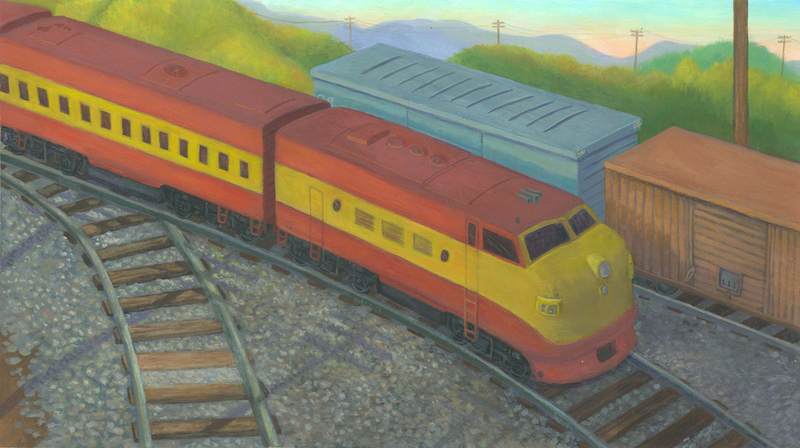 This painting is based on a toy train I bought during my research phase. This is my rough thumbnail of a ferret pulling a badger in a train wagon. I sketch my concepts really small and then blow them up in Photoshop. It helps me see the basic shapes and composition. Then I built the the whole thing in Photoshop using hand painted items, such as the colors and textures and the lettering. I couldn't decide whether to go with a dark red palette or a neutral one.